Mobile developers are increasingly finding the power of social integration in their apps, which is one way to make them engaging and sticky and to help get the word out about their apps. But all social integrations are not equal. User by user, Twitter integrations on mobile apps drive three times as much sharing as Facebook integrations, according to new data from app analytics firm Localytics. And the advantage is even more pronounced when you look at active users. Localytics examined all mobile apps with more than 500 monthly active users connecting to Facebook and Twitter from January through July 2011. It found that 20 percent of all mobile apps on Android (s GOOG), iPhone(s AAPL), iPad, BlackBerry (s RIMM) and Windows Phone 7(s MSFT) apps have social integration through Facebook or Twitter. Facebook is the most popular social network by far: 10 percent of all apps connected to Facebook only, compared to just one percent of apps that connect to Twitter only. 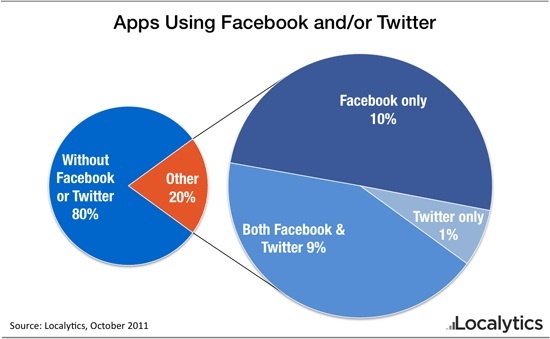 Nine percent of apps connect to both Twitter and Facebook. Compared to Twitter, Facebook overall generated twice as many events, which Localytics counts as sharing, liking or following by a person from an app. But on a pound for pound basis, Twitter won out handily when it came to driving user engagement. The average Twitter user shared three times as many events than the average Facebook user, Localytics found. When you examine the active user base of each network, Twitter generated 50 events per 1,000 users compared to 11 events per 1,000 Facebook users, said Localytics. Now, Facebook has a far bigger community with 800 million users, including 350 million who access the service through a mobile device. Twitter has more than 200 million accounts registered with 100 million monthly active users. 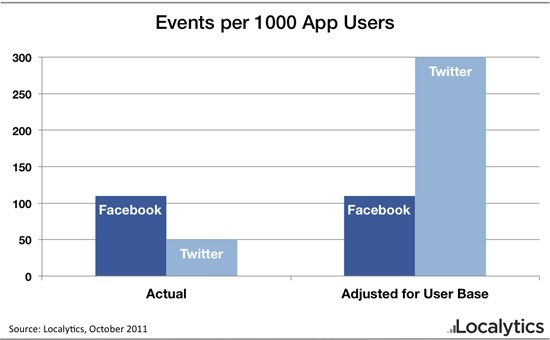 So with that size advantage, it’s not surprising that Facebook produces more user events overall. Daniel Ruby, director of online marketing for Localytics, said it might be that Twitter’s more flexible approach to identity, which allows people to be more anonymous, can prompt more sharing. It’s also probably due to the inherent differences in the two services. Facebook is more of a personal network of friends, while Twitter is often used as a broadcast communications platform for sharing information. I know I find it easier to Tweet something than sharing it on Facebook, where I might be sensitive to overwhelming my friends. But having two options can be helpful for people who might share differently according to each situation. For developers, it’s important to know what tools are available and how they might differ. Twitter has smaller reach, but it has a very active user base. And with its iOS 5 integration, (s aapl) it might be in a position to grow rapidly. For the four of every five apps that don’t have social integration, their developers might want to think about adding it. As I wrote about earlier, there are a lot of apps that don’t connect to backend services of any kind. But the payoff for those that do are more engaging and dynamic apps, especially ones that have social integration. Those apps can not only keep people involved, but they can draw in new users who can be attracted through sharing on social networks. And as Localytics points out, developers can also get interesting insight into what features or content are popular on an app based on what people are sharing. That can help them tweak or tune the app accordingly. Because Facebook doesnt even put a reshare button on their damn mobile apps. We just updated for iOS 5 to allow full twitter integration in ArtCards by Elizabeth Boylan App. We already had facebook for status updates and posting to friend’s walls. But for art, tweeted custom ArtCards look really nice on Twitter’s interface, and there’s a little something extra sweet with every tweet in iOS 5. Apple did a great job.